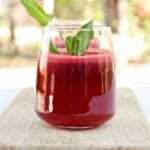 This apple, beet, carrot, celery, and radish juice is my absolute favorite carrot beetroot juice recipe. It is both vegan and gluten-free. D and I recently bought a juicer. After watching numerous food documentaries describing the various chemicals and preservatives that are pumped into all processed foods, juices included, D was finally convinced that the Tropicana had to go. I’m not much of a juice drinker in general — my go to beverage being water so the only times I would indulge in a glass of bottled OJ would be to accompany my vodka. D, on the other hand, would go through a one gallon jug of Tropicana “pure and natural” orange juice in two days. No joke. And he really thought this was one of his healthier habits. I am a firm believer that juices should NOT be from concentrate and should be consumed as soon as they are squeezed. That’s what pure and natural juice means to me – not something from a bottle that’s been traveling cross country via trucks to then patiently await an eager customer to pick it out of the grocery store. So since our affordable Black and Decker juicer arrived we have been making juices galore. Dave always going for the fruity one, and me for the vegetable juices, like this carrot beetroot juice. Oh and what fun it is to pulverize a carrot in seconds and see the beets turned into dangerously bright fluid. This apple, beet, carrot, celery, and radish juice is my absolute favorite vegetable juice recipe. I make it every time I’m feeling proactive enough to want to wash the juicer afterwards. That is the annoying part – with several different pieces and all the waste junk that didn’t get squeezed, it is quite a pain to wash the juicer. And it get’s even more annoying if you wait to wash it – as all the gunk dries up and sticks to the plastic. No free lunch right? For this carrot beetroot juice recipe, it’s worth it though. I urge you to invest in a juicer and start making your own pure and natural juices immediately! Let me know what you think of this carrot beetroot juice in the comments below! It’s absolutely my favorite juice of all time so I hope you love it as much as I do. If you’re looking for something more like a smoothie be sure to treat my peanut butter spinach smoothie! This post has affiliate links from which I would earn a small commission from your purchase. 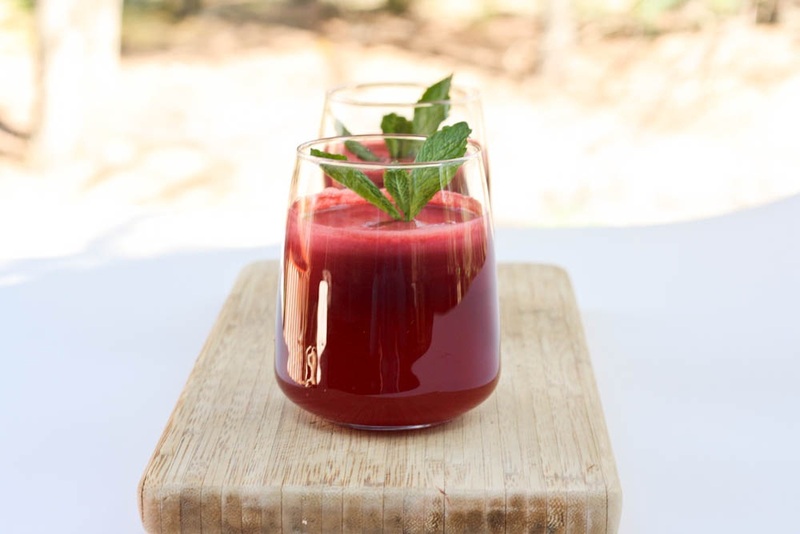 What better way to start the day than with fresh made vegetable juice - try this carrot beetroot juice asap! I bought a juicer a few months ago and I love it! My favorite vegetable to juice oddly enough are sweet potatoes. They are surprisingly sweet and fairly creamy. What I love the most about having a juicer is the lack of waste in my household now. Whenever I have vegetables or fruits on their last legs, I’ll throw them in the juicer. Cleaning it is a pain though. Especially if you wait! I like the vegetable combination in your juice recipe, Vicky. I’ve actually never juiced a radish, so I’ll have to give it a try. Thanks for sharing! Sweet potatoes? That sounds interesting – I never would have guessed that would be good in juice. I’ll have to try it! Let me know how you like this juice if you try it! Hey there, I found your blog on TasteSpotting and am loving what I see so far! 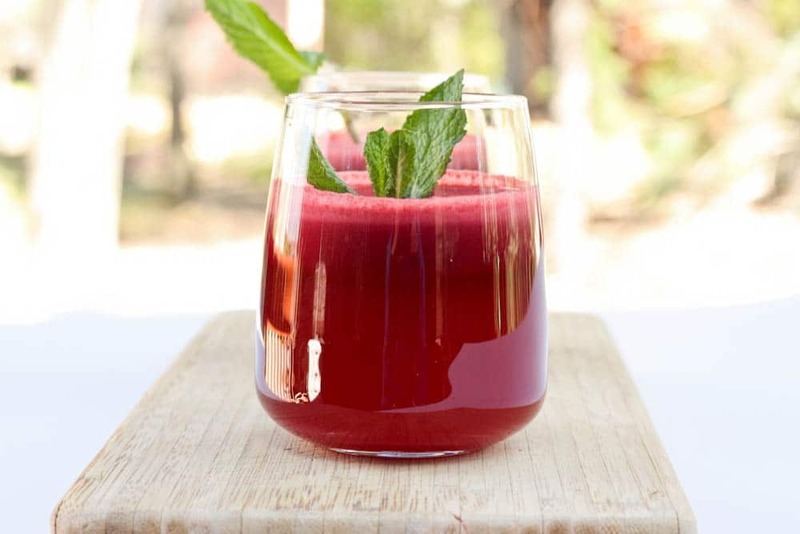 Your veggie juice looks tasty and nutritious – I want to get a juicer ASAP now. Looks like fun and the color is awesome! Thanks! I’m flattered that you like my blog and yes having a juicer is awesome! Especially with the summer coming around fresh squeezed fruit and veggie juices are even better! I just used this recipe, minus the radish and ginger, but it still tasted so good without it! I’m so excited to have finally used my juicer. I hope to use it more often in the future. Juicing is definitely worth the time in savings and benefits. You can even use the shredded chunks on other meals (that’s where the fiber is).